Accelerated wear testing using the Taber Abraser assists stone floor manufacturers to evaluate the durability of proposed floor surfaces. The durability and wear resistance of a floor is an important design consideration to ensure that it stands the test of time. If you have ever walked down an old set of stairs you will notice that the centre of the steps may be dished. This is due to the stone wearing or eroding away over time from hundreds of thousands of people scuffing the surface. ASTM D4060 Standard Test Method for Abrasion Resistance of Organic Coatings by the Taber Abraser. Floor surfaces that require a high resistance to abrasion should achieve an abrasion index greater than 25. This can generally be achieved quite easily with hard stones such as granite, however soft stones such as limestone, sandstone and marble require more rigorous testing to assess the propensity of the material to wear away. The Taber abrasion testing is well suited for polymer floor coating systems to assess the effect of wear resistance of different compositions, fillers and plasticisers. 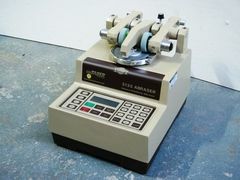 During this test, a sample is affixed to the base of the Taber Abraser which is rotated against abrasive calibrade wheels that apply a specified force. The abrasion resistance or index is determined by the volume loss of the material that has been subjected to the accelerated wear. By determining the density of the material, the volume loss is calculated by the change in mass due to the Taber Abrasion. Safe Environments assist in assessing the wear resistance of floors by conducting accelerated wear tests using the Taber Abraser, ensuring that the stone floor is durable and fit for purpose.